Member of the West-Coast Sustainability Centre, non-profit organisation. Board memeber of the Framtidsperspektiv, economic association. Carlsson, D., Ivarsson, M., Climate Change in Deep Time (2018). Goldschmidt Abstracts. Carlsson, D., Ivarsson, M., Climate change and its connection to the deep biosphere. The National Geosphere Laboratory conference 2018. Poster presentation at the Bolin Days 2017, the Bolin Centre for Climate Research. European Researchers' Night, supported by the European Commission and Marie Skłodowska-Curie actions, Horizon 2020. Invited talk in Stenungsund: What is research, and how do you become a researcher? Project leader for the yearly Summer Academy in Chemistry 8th-11th of August, held by Molekylverkstan Science Center and its owners AGA Gas, Akzo Nobel, Borealis, Inovyn and Perstorp Oxo. The Academy hosts 20 high school students from Scandinavia, with the aim to inform the next generation about future chemistry jobs and research areas. "Impacts and their Role in the Evolution of Life" in Estonia, including poster presentation of "Fossilized microorganisms in deep rock and deep time; proxies for past ocean chemistry and climate change", and three days of field work and data analysis; Geophysical measurement methods for impacts. Rencontres Exobiologiques Pour Doctorants, Red’17, Astrobiology Introductory Course in Le Teich, France. "Volcanism, Plate Tectonics, Hydrothermal Vents and Life" in the Azores, including two days of field work and data analysis; Bacterial communities in volcanic environments (lava tunnels and fumaroles) and DNA sequencing. 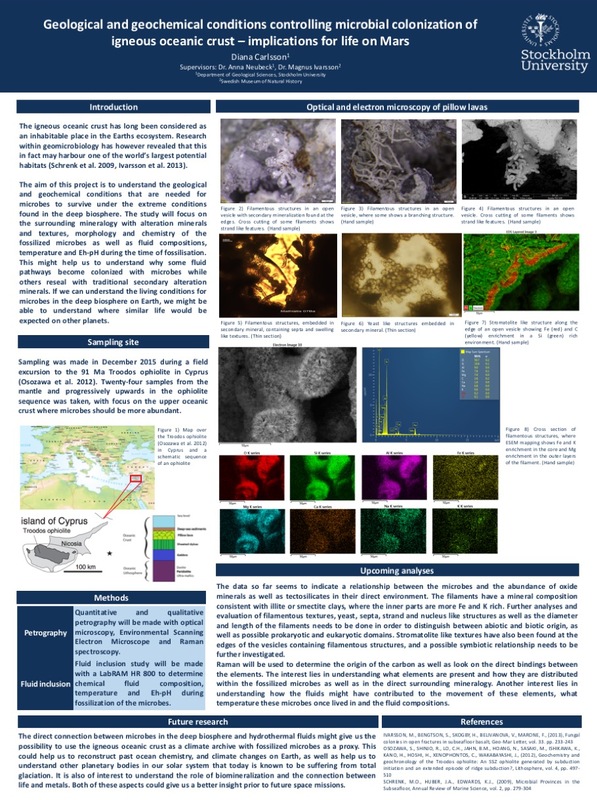 "Biosignatures and the search for life on Mars" in Iceland, including poster presentation of "Geological and geochemical conditions controlling microbial colonization in igneous ocean crust; implications for life on Mars", and three days of field work and data analysis; In-field detection of ATP as a generic biomarker of microbial life in volcanic environments. Education and public outreach. Accountant. Founder and CEO, financial statement, budget, salaries, taxes, accounts payable, accounts receivable. Researcher, research area: fossilized life in igneous crust. Gothenburg Astronomical Society, invited talk: Mars Missions 2020 and the search for microbial life. Lokaltidningen STO (2017-08-23) Finns det liv på Mars? By Ingemar Hammarström. Berzelius days by the Swedish Chemical Society. Exhibitor for Molekylverkstan Science Center and its owners AGA Gas, Akzo Nobel, Borealis, Inovyn and Perstorp Oxo. Aurora project in collaboration with Pieter Kuiper, Docent in solid state physics at the Linnaeus University.